Whether you’re in the process of preparing for a move, planning a move in the near future, or just like to be proactive, there are ways that you can add value to your home. Although the market is improving, times are still tough in the real estate market. So, when it comes to selling your home, you want every competitive edge you can have to set you apart to potential buyers. A 2014 report from Remodeling Magazine weighs the costs of home improvement options with the return value when it comes to reselling your home. Let’s explore the bottom line and how to add value to your home. According to HGTV, kitchens sell houses. Whether a potential buyer enjoys cooking or not, a kitchen is a huge selling point for a home. In today’s market, a lot of buyers are looking for a gourmet kitchen, so investing in improvements to this room should return a nice payoff in the end. First, give your kitchen a neutral color palette. Having a neutral, monochromatic color scheme remains one of the top kitchen design trends in the industry, therefore it will be widely desired by most potential buyers. 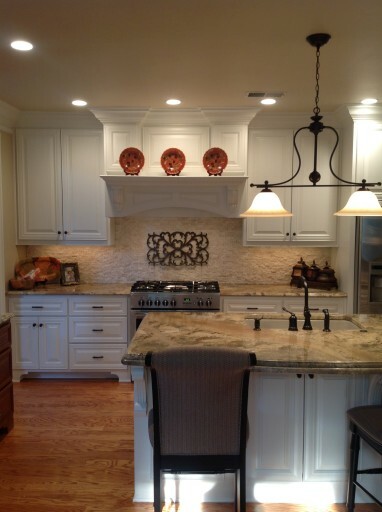 Updating your light fixtures is another good option to consider during a kitchen renovation. Next, be sure your sink and other appliances are up to date. Finally, extend your kitchen if possible, either by making an addition to your home or by borrowing space from an adjoining room or closet. When it comes to kitchens, size matters – the bigger the better! The more square footage you have, the more kitchen counter space you’ll have! So, here’s the bottom line when it comes to updating your kitchen: for a minor kitchen remodel, the average cost is $18,856, the resale value is $15,585, and therefore 82.7% is recouped, and for a major kitchen remodel, the average cost is $54,909, the resale value is $40,732, and therefore 74.2% is recouped. Bathrooms are the next area that might need attention before putting your home on the market. You can never have too many bathrooms in a home. If your house has a greater number of bedrooms than bathrooms, you should consider adding an additional bathroom. Another thing to consider when determining if you should add a bathroom is an area like a basement that might not currently have a bathroom, in which case one could be added there. Remodeling a bathroom is another option. Should you opt for a bathroom renovation, focus on the master bathroom. Having a complete master suite is a big draw for potential buyers. First, be sure your sink(s) and tub(s) or shower are up to date. Then, add square footage. Find more space for your master bathroom by opening up a closet. Who doesn’t want more bathroom counter space and his-and-hers areas with separate sinks? So, here’s the bottom line when it comes to updating your bathrooms: the average cost of a mid-range bathroom renovation is $16,128, the resale value is $11,688, and therefore 72.5% is recouped. Basements are another key area in your home that has a huge potential to attract buyers. The basement should be a multipurpose area well equipped for entertaining. Be sure your basement has an open floor plan and designate certain areas for adults and kids to play. 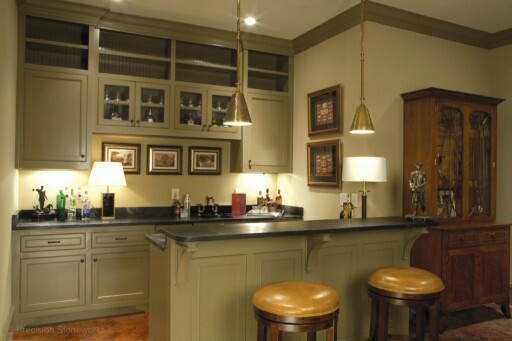 Consider adding a showpiece like a bar. This will make the main area instantly eye catching and inviting to buyers who like to entertain and impress. Don’t forget, everyone loves a fireplace. If the floor plan and structure is right, extending your upstairs fireplace to the basement shouldn’t be too taxing. So, here’s the bottom line when it comes to updating your basement: the average cost of a mid-range basement renovation is $62,834, the resale value is $48,777, and therefore 77.6% is recouped. If you’re considering updating your kitchen, bathroom, or basement in order to add value to your home before placing it on the market, we would love to work with you! We’re dedicated to quality and attention to detail in every project, and our skilled craftsmen will do everything they can to increase the value of your home. To get started, contact us today!